One of Vince's friends made this lovely tribute to him using his "Strong Arm" photo - just beautiful! Tonight was our friend Vince Guereca's wake. We couldn't be there; so, we streamed it online through his churches website. Ever since Vince passed last Thursday, I've been sad; but I had no idea I would break down so much tonight. My whole body was shaking; I just could not contain the sadness any longer. Knowing that I couldn't be there, I prepared a written word to be read at the wake tonight. It was completely surreal watching someone else read my words through the video screen. My dad wrote something too, and it was beautiful. So many people got up to share stories of how Vince had impacted their lives; it was a wonderful testimony of Vince's work for God here on Earth. Vince was such a wonderful person. It's so hard to reconcile the outcome of his battle with cancer in my heart and mind; but I know that there are many things I will not be privy to in this lifetime. One thing I forgot to put in my speech about Vince was something that happened one Sunday when he was particularly not feeling well. I remember he asked me, Mr. C, and our friend Neil (also a stem cell patient who just successfully underwent his third transplant - AMEN!) to go down to the little chapel just down the hall from the stem cell out-patient clinic to go to a service with him. The CTCA has chaplains and pastors who will put on mini-services every Sunday for those of us stuck in the hospital and unable to attend at our home churches, etc. Of course, we went with him. He was hooked up to a bunch of tubes, getting some sort of infusion; and honestly, he was looking thin and tired. When we got to the service, we sat in the back, as we were the last people in; and naturally, the pastor asked us to introduce ourselves and say if we had any prayer requests. Stupidly, I acted like an idiot, barely talking and barely even remembering to mention my mother who was upstairs in the stem cell in-patient ward at the time. I don't know why I was acting so thoughtless, it's not like me to be tongue-tied in any way; but I was, and I felt like a fool. Vince was just sitting a few chairs away from me; so when it was his turn to speak, he stood up and introduced himself. The only prayer request he had was that everyone please pray for Mr. C and my adoption of Desmond - that it go smoothly and that we receive all the funding that we need. Needless to say, I was humbled to the point that I wished I could literally crawl under a chair like a shy, little kid! Here is a man fighting for his very life, and instead of asking for people to pray for him, he asked only that they pray for US! That is something I will just never forget. That is just a tiny portrait of what Vince's heart was like. It was beautiful and selfless, and so full of love for people and his Abba God. I was so blessed to have known him, and I look forward to hearing all of the amazing things he has to tell me when I get to see my brother again one day in Heaven. I met Vince Guereca on a battlefield – the stem cell unit of the Cancer Treatment Center of America in Zion, IL where my mom was and still is undergoing treatment for stage 4 acute lymphoblastic leukemia. As in many battles, you seem to quickly bond with those in the trenches alongside you – your brothers in arms – and my entire family got to know and love Vince and Silvia both. It was very easy to love Vince – with his big, bright smile and readiness to listen, he was an instant friend to my family and my mom especially. They would often encourage each other with Bible verses and stories about life and what God had already done for them both – so many miracles. Yes, it IS a cancer center; but it wasn’t all dreary and dull. We had good days too - an afternoon playing Apples to Apples (Silvia won, of course J) or the day we got Vince to eat Kentucky Fried Chicken (no mere feat considering how much his appetite had waned at that time in his treatment). But my favorite times were when Vince would talk about Jesus. He had such a HUGE heart for our Abba God, and he wanted everyone to KNOW how much Christ loved his children. I can honestly say I doubt I’ve met anyone as willing to be bold for Christ in a real-life sense as Vince; and I hope I can be more like him in that respect each and every day. When Vince talked about Jesus his whole face lit up, and when you seemed to “get” what he was trying to tell you about God, he broke out into that famous big grin of his - the only other time I saw his face shine that bright was when he spoke of his beloved wife, Silvia, or his four kids. He once told me that if his journey with cancer ended with him in Heaven, it wouldn’t matter how miraculous it all was around him, he would be waiting for Silvia to join him so that he could enjoy it all with his sweetheart. While I’m sure Vince actually really IS enjoying himself in Heaven at this very moment, it was still touching to me to hear him speak this way and how full of love he obviously was for his wife. Vince also praised his children often during the hours spent getting infusions and treatments in the stem cell clinic. He was beyond thrilled to be a dad, and he would say over and over how he knew God had amazing plans for each one of his kids. He couldn’t wait to see what they were going to become, because he already knew each one was such a wonderful human being who loved Jesus…”everything else is just a bonus”, he told me. Toward the end of Vince’s battle, he and I would talk about F.F. Bosworth’s book Christ the Healer a lot; and maybe it is particularly because of those conversations that Vince’s passing has been so especially difficult for me. For the first couple of days, I just could not understand how our loving Christ Jesus, who so obviously wants to heal his children, would not heal Vince. Why he would let this disease “win”. I was praying and praying for some sort of understanding…some sort of peace; but I felt as though God was not answering my prayers. It was not until last night while I was once again trying to figure out what to write here that God spoke to me. Often, when God talks to me personally, it is a mere word or phrase; and I feel like He then leaves it up to me to discover the significance for my life and circumstances. Perhaps this is because my Abba knows me better than anyone and knows how much I like a good mystery (haha! ); but deep-down I’m sure it’s because He wants me to grow and learn. But I was angered by this word – invincible?! Really, God?! Vince is no longer with us, and you give me the word “invincible” as my answer as to why? I was bewildered. I began to twist the word around and around in my head. You see, I love languages; and in college, I got to study several, including many years delving into Latin. ONE WHO CANNOT BE CONQUERED. Take also into account the fact that Vince’s name (or at least the sound) is right smack in the middle of this word, and it all became clear to me. Vince was not conquered. He was not vanquished. He did NOT lose. Yes, it may seem to the world that he did lose. It may seem that Satan won; that the disease won…but that is the glorious thing about Christ’s never-ending love and mercy – we get to live forever with him, no matter what our circumstances here on Earth may have been. Vince is “more than a conqueror” through Christ’s sacrifice on the cross at Calvary. Vince is in Heaven – totally restored, totally whole, totally healthy! AMEN! YOU are the losers! YOU are the vanquished ones! Yes, we will all miss Vince while we live out the remainder of our days here on Earth, that is a sad truth; BUT we can live on with the constant reassurance that we will be reunited with him again for all eternity. I am so glad that we all serve a SAVIOR who never closes a door without opening a window. I am so glad that Christ Jesus loves us lowly humans enough to always gift us HOPE. I am so glad that when we ask for grace and mercy and peace, it is given to us. 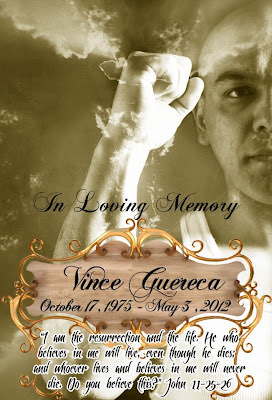 And I am so glad that God allowed me to know my brother, Vince Guereca, even if only for a short while here on Earth; and I look forward to seeing him again in Heaven – he will have so much to tell me (and all of us), I’m sure! PS: Vincent means "conquering"...he was born to be a winner! RIP, my friend.